The Chos of suburban Seoul, South Korea, didn't have much. They lived in a rented 430-sq. ft. basement apartment, according to the Korean paper Chosun Ilbo, and when they set off for the U.S. in 1992, Cho Seong-Tae told his landlord that the family was going to America "because it is difficult to live here" and that it would be better to live in a place where he is unknown. The Chos alighted first in Detroit but eventually settled in Centreville, Va., where they live in a two-story, cream-colored townhouse with two vegetable patches in the back, one with lettuces just beginning to sprout. They are said to be a hard-working couple who speak only a little English and run a dry-cleaning business. Their daughter graduated from Princeton in 2004 and, according to the Washington Post, works as a contractor for the State Department. The Chos are said to be cooperating with police; they allowed a 90-minute search of their home on Monday evening. At Westfield High in nearby Chantilly, Cho was a quiet boy. Joseph Boayu, a high-school acquaintance, said Cho was so withdrawn that "sometimes you'd ask him a question, and he'd not even acknowledge that you asked him." He also said Cho earned A's in math. At Virginia Tech, Cho sometimes referred to himself as Question Mark and spoke in a whisper, if at all; one of his suite mates told CNN last night that "he was just like a shadow." Mostly what he did every day was this: sit in the spare common area of the six-man suite in Harper Hall and type on his laptop. But he didn't spend endless hours on Facebook or wired into his iPod. He also never talked about his family. He didn't seem to have friends, and he rarely spoke, even to his roommate. He ventured out to attend class, to eat and, since February, to work out at the gym for the first time. It was a big deal in the second-floor suite to get a hello out of him. A suite mate, Karan Grewal, a senior from Northern Virginia, told TIME that "we just thought he was shy." Grewal said there was no sign of medication in Cho's room, no books, no posters on his walls. While Grewal acknowledged that it would have been possible for Cho to hide guns in the suite, he said Cho never talked about weapons or killing. He simply didn't talk at all. For years, Cho's odd behavior indicated to some university authorities that he could be dangerous. In coming weeks, the school will almost certainly have to explain why it did not do more to help him or expel him before his massacre. 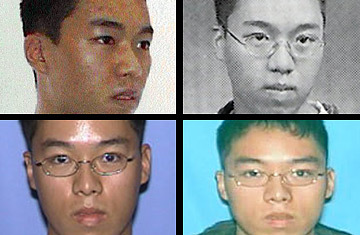 In December 2005, campus police and mental health professionals in Blacksburg, Va., arranged to have Cho committed to a state psychiatric facility. Cho's brief hospitalization for suspected mental illness was disclosed this morning by Virginia Tech police chief Wendell Flinchum, who said Cho was taken to St. Albans psychiatric hospital in Radford, Va., on Dec. 13 of that year after two women students (neither of whom was among Cho's shooting victims) called campus police complaining that Cho had made troubling contacts with them. A third person  identified last night on CNN as a suite mate of Cho's  had also told police at the time that Cho was contemplating suicide. Dr. Harvey Barker, head of the community mental-health agency called by campus police, told TIME's Michael Lindenberger that his agency had performed an involuntary psychiatric evaluation of Cho before he was committed to St. Albans. "We did an independent evaluation at the request of the police department," Barker said. "We did not make an recommendation [as to whether he was fit to remain on campus or in school]. That was not our role." Neither the campus police department's nor the hospital's records on Cho were part of the material accessed by the state's background-check system for firearms purchases. Nikki Giovanni, the feminist poet and teacher at Virginia Tech who stirred the campus convocation yesterday with a poem, had Cho in a poetry class two years ago  and it wasn't long before she had him tossed out. "There was something mean about this boy," she said. "Troubled kids get drunk and jump off buildings. It was the meanness that bothered me." Giovanni recalled that Cho came to class in dark sunglasses and a hat. And every day, from very early in the semester, she would ask him to remove the one and then the other. "We would have this sort of ritual," she said. Giovanni recalled that Cho "was very intimidating to my other students." Eventually, other kids began skipping class because of his behavior. The poet then wrote creative writing department boss Lucinda Roy a letter  in part to create a record  asking Roy to remove him from class. Giovanni said Cho turned in material that wasn't poetry but just junk. "He was writing weird things," she recalled. "It was terrible.... It was just intimidating." In two achingly bad plays Cho authored  they were posted by AOL yesterday  he suggests he may have been sexually abused. In both plays, a schoolboy named John accuses authority figures of molesting him. In a play Cho titled Mr. Brownstone, John says the eponymous teacher raped him. "I wanna kill him," John says. In the other play, Richard McBeef, the accused molester kills John with his bare hands in the end. Cho exhibited strange sexual behavior at Virginia Tech. Roy told CNN that he was taking pictures of women under desks, and two men identified as suite mates of Cho's told the network he had stalked three women. They said Cho usually slept fitfully and with the lights on. During the months that Cho lived in the dorm, his suite mates said he never had a single visitor  no girlfriends, not even family. "He seemed to be crying behind his sunglasses," Roy told TIME. "It was like talking to a hole sometimes.... Everything emptied out and seemed very dark when he entered." Roy shared her concerns with campus police and counselors, but they told her that unless his threats were explicit, there was little they could do. So Roy, in part because the school couldn't prevent Cho from taking courses, took him on for one-on-one classes herself to keep him away from other students. Campus security, meanwhile, offered Giovanni protection. But the poet said, "He didn't scare me." She learned about the shootings on Monday, while flying back from the West coast. When she first learned the suspect was an Asian male, she said, "In the front of my mind, I knew it was Cho."